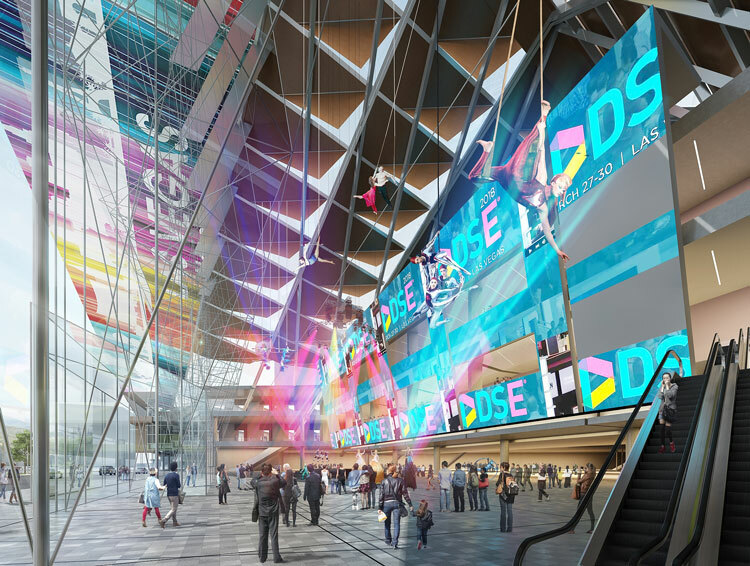 Las Vegas — The Las Vegas Convention and Visitors Authority (LVCVA) Board of Directors approved a recommendation to retain tvsdesign/Design Las Vegas to provide design services for the Las Vegas Convention Center District Phase Two Expansion project. The decision is a tremendous milestone for a project that will secure Las Vegas as the world’s premier business destination for decades to come. In 2016, Las Vegas hosted nearly 22,000 meetings, conventions and trade shows, which directly supported an estimated 54,800 jobs paying $2.3 billion in wages and salaries. The Las Vegas Convention Center hosted 22 percent of convention attendees traveling to southern Nevada, which directly supported approximately 11,800 jobs, paying $495 million in wages and salaries. Including indirect and induced impacts, the Las Vegas Convention Center’s attendees generated $2.7 billion in economic impact throughout the local economy. In its November 7 meeting, the Las Vegas Convention Center District (LVCCD) Committee, a sub-committee of the LVCVA Board of Directors, received a recommendation from LVCVA staff of tvsdesign/Design Las Vegas as the preferred designer for the project. That recommendation was approved and moved to the full Board of Directors for approval. The recommendation of tvsdesign/Design Las Vegas is specific to Phase Two’s $860 million expansion project. The process of selecting a design team started in mid-June and included review of qualifications and proposals from numerous globally recognized design teams. On October 25, a design competition was held featuring presentations from three world-class design finalists. The designs presented in the competition focused on the LVCCD’s 1.4 million-square-foot expansion, which will include at least 600,000 square feet of new, leasable exhibit space. LVCVA staff worked in partnership with Cordell Corporation principal Terry Miller, the agency’s contracted owner’s representative, to develop the vision for the expansion and renovation project. The LVCC District Expansion (Phase Two) and Renovation (Phase Three) are expected to support nearly 14,000 construction jobs and nearly 7,800 full-time permanent jobs upon completion. The project will generate an additional $2.1 billion in economic activity during construction and upon completion will have an annual incremental economic impact of $810 million while attracting more than 600,000 additional visitors each year. The LVCC District Expansion and Renovation will be completed in a phased approach with a projected completion date of 2023. Construction of the Phase Two 1.4 million-square-foot expansion is projected to be complete by the end of 2020. The next phase will be the complete renovation of the existing 3.2 million-square-foot facility. The phased approach will ensure that no business will be displaced during the construction and renovation.